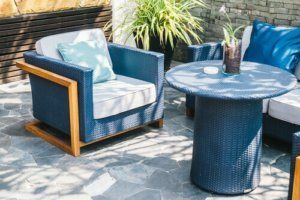 The summer months are filled with beautiful days and warm evenings, the perfect recipe to be able to spend lots of time outdoors relaxing and enjoying the company of friends and family. Give the furniture a fresh coat. Before setting your furniture out permanently for the season, give it a good inspection. Are there scuffs, or splinters? If you have natural-colored wood furniture, give those rough spots a quick sanding and apply a fresh coat of an outdoor finish. You also can paint your outdoor furniture for more color. It’s important to first remove the existing finish or paint with a hand sander. Once that’s done, choose a color that ties in with your backyard scheme for a fresh, simple look, or go bold and choose a color that will make pieces pop as a focal point. Shed a little light. Lighting tends to be one of the most overlooked elements of garden design, yet it has the ability to give a home’s backyard landscape a dreamy quality. If you’re not quite ready to commit to the installation of a new lighting scheme, try installing a simple string of globe or twinkle lights overhead – it can convey the same effect. A string of paper lanterns is another option. Consider a rug. It might seem simple, but dressing up the patio floor by adding an outdoor rug that picks up the color of your home – or the colors used in the surrounding landscape – can transform a basic space into a colorful, more inviting space. An outdoor rug also can work double duty by softening the hardscape and pulling the look of the entire area together. Add shade. Do you like to relax in your backyard? But what about when the sun’s angle hits the patio just so, and suddenly it’s too hot and bright to enjoy your favorite spot? Instead of retreating indoors to beat the heat, try installing a simple rod and curtain that you can draw for some shaded relief. Finally, remember the details. Sometimes even the smallest touch can make the biggest difference. It can be as simple as adding a few colorful toss pillows or cushions to create a cozy area, or adding carefully placed hurricane lanterns to light a path and draw guests into the garden. At Republic West Remodeling, we help countless homeowners design and enjoy their outdoor living spaces in Scottsdale. Contact us today to schedule a free consultation.